Pink Floyd is a British progressive rock band known for its concept albums, sonic experimentation, profound lyrics, and elaborate concerts. They began as an underground psychedelic band, then transitioned to a more progressive sound after the departure of their original lead singer/guitarist, Syd Barrett, releasing many famous and beloved albums such as Meddle, The Dark Side of the Moon (considered to be one of the greatest rock albums of all time), Wish You Were Here (a tribute to Barrett), Animals (loosely based on Orwell's Animal Farm), and The Wall. After the release of their 1983 album The Final Cut, the band separated due to tensions between bassist/lyricist Roger Waters and guitarist David Gilmour. Gilmour restarted the band in 1987 without Waters, resulting in a lawsuit that was ultimately decided in Gilmour's favor. Albums released in 1987 and 1994 (A Momentary Lapse of Reason and The Division Bell) sold well, and were described as "fair forgeries" even by the estranged Waters, but failed to capture the magic that the band had created during the 1970s. After many years, Pink Floyd and Roger Waters reunited at the Live 8 concert in London on July 2, 2005. 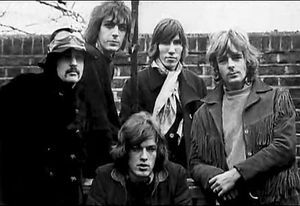 Pink Floyd are one of the highest-selling acts of all time, having sold over 250 million albums in their long history. The Dark Side of the Moon and The Wall are their two best-selling albums, with Dark Side staying on the Billboard Top 200 Albums chart for a record 741 consecutive weeks, and The Wall being the 4th most sold album (and most sold double-album) in the United States. This page was last modified on 16 November 2017, at 15:55. This page has been accessed 11,228 times.